How often I'd pass by those little hairy brown fruits. But when the sign read, Kiwi: 6 for $3.00, I couldn't pass up the bargain. Beneath the peel, I discovered green flesh, white pulp in the center, and small black (edible) seeds. Mmm, not bad. The taste reminded me of a mixture of banana, pineapple and strawberry, all rolled into one small fruit. 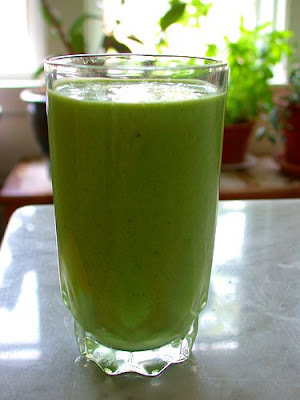 Today, I threw some into a smoothie I was making, and ooolala, this one's a keeper. 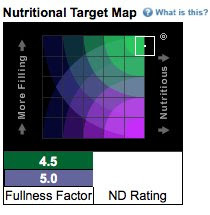 One of my new favorite haunts on the web is Nutrition Data. Look what else I found beneath the peel – these little buggers pack a wallop of Vitamin C! The question I probably hear more than any other since I put down the cheeseburgers and picked up the fresh produce is Where in the world do you get your protein? 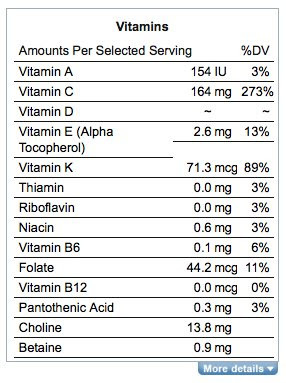 I've written about this before here, but the search for actual data to show my incredulous family members is how I first stumbled upon the site Nutrition Data. Protein quality is dependent on having all the essential amino acids in the proper proportions. An Amino Acid Score of 100 or higher indicates a complete or high-quality protein. Ta da! A complete protein. And, trust me, three of my handfuls is far more than 1 cup. Our little kiwi, by the way, scored 105 – another complete protein! The closer a food is to the right edge of the map, the more essential nutrients per calorie it contains. The closer a food is to the top edge of the map, the more likely it is to fill you up with fewer calories. So, if you want a lot of bang for your buck and a whole lot of vital nutrients that will fill you up without filling out your waistline, don't pass by the hairy brown fruit and spinach next time you're grocery shopping. Question: Anyone have tips on how to peel a kiwi's paper thin skin without wasting too much of the flesh in the process?